We may get commissions for purchases made through links in this post. A few years ago, I started having heart palpitations – rapid and/or pounding heartbeats. My resting heart rate would stay elevated for as much as 16 hours at a time, even keeping me awake at night. The symptoms came without warning, and would disappear just as mysteriously… until next time. I thought there might be something seriously wrong with me, but the more I researched my symptoms the more it sounded like anxiety attacks. And yet, I wasn’t feeling particularly anxious – just the usual stress. My first step was to see a doctor and rule out any physical problems. Anxiety attacks can produce a lot of strange symptoms: heart palpitations, numbness of extremities, and even loose stools. But it’s all connected to adrenaline. Since any of these symptoms could belong to another ailment, it’s important to see a doctor for the appropriate tests. My doctor quickly ruled out out every possibility other than anxiety. I often felt fine fine, but had an attack anyway. And then the symptoms of the attack would worry me, and that would make me more anxious. Apparently, anxiety is a top reason why people end up in the emergency room, thinking they’re dying. But if you know your body is okay, then you can at least stop worrying about the weird symptoms. Anxiety is really common, and having it doesn’t mean you’re crazy or weak. Our bodies and brains evolved to handle immediate stresses, such as tigers coming to eat us. Fear and worry made adrenaline flood our bloodstreams so we could run or fight. But in our safe modern world, we worry about things like financial security, world events, and our relationships. We feel like we’re being chased by predators, but running and fighting rarely solve modern problems. And all that pent up adrenaline has nowhere to go. Doctors can prescribe medications to help. 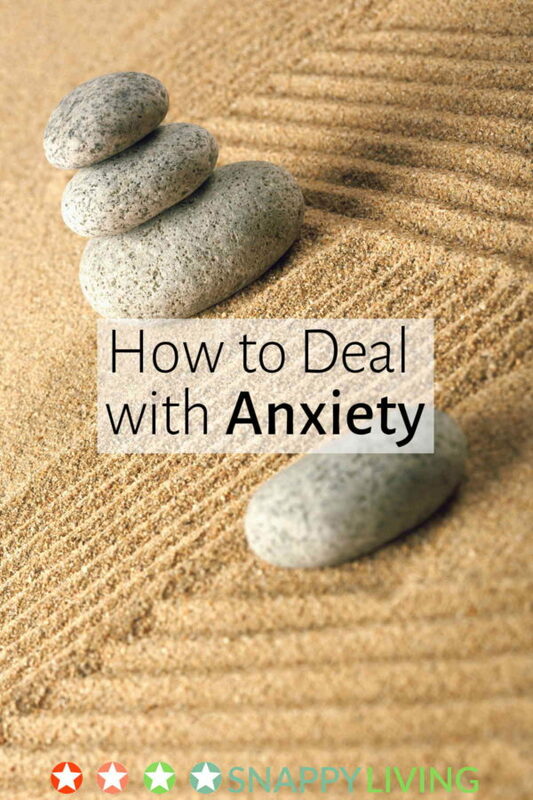 Anxiety can be treated with a number of medications. If a doctor recommends medication, don’t let anyone shame you out of taking it. You may only need it for a few weeks, just to get your feelings under control. I had lived with such a high-stress level all my life that I had no idea what “relaxed” felt like until I took Xanax. I took it occasionally for a few months, but haven’t needed it in years. Cognitive behavioral therapy often does wonders for anxiety. Not all psychotherapy means talking about your parents for hours on end. This type of therapist simply helps you figure out how to live better. For example, maybe your problem is simply that neither of your parents knew how to cope with stress, so you never learned those skills. The therapist will help you learn those skills and send you on your way – no navel gazing required. On the other hand, if you do have an underlying issue such as a past trauma, the therapist will help you work through it. You can also reduce your stress. Again, you need to check with a doctor before using any of these: for example, yoga can be too strenuous for some people (including pregnant women). Meditation. Meditation is the easiest way to get big results fast. You don’t have to take classes or buy DVDs. You just find a quiet place to sit with your eyes closed and do your best to think about nothing. When thoughts come into your head, as they will, imagine putting them in bubbles, floating gently away. After a while, you’ll focus on the bubbles and forget about some of your worries. Then you might want to imagine being somewhere peaceful – a beach, waterfall, park, or a particularly beautiful landmark. Whenever you catch yourself getting worked up about something, take a moment to close your eyes and meditate. And remember that at least 99% of the things we worry about never happen. Yoga. Take yoga classes or just get a yoga DVD for anxiety. Be aware that some routines are more strenuous than others, and you don’t need to sweat a lot to get the anti-anxiety effects. Sstick with a routine that’s comfortable to your body. Deep breathing exercises. This particular exercise brought my heart rate down significantly when it was palpitating: exhale completely, squeezing your abs to get all the air out of your body, then inhale deeply, until your lungs almost hurt. Then exhale slowly, again squeezing out all the air. Do this three times, anytime you start to notice anxiety symptoms. Vitamins and herbs. Certain vitamins and herbs can have calming effects. Since most of them can also have side effects in certain people, I’m not comfortable recommending any. Talk to your doctor and do your own research. Ignore your symptoms. Once your doctor has ruled out anything dangerous, make an effort to ignore your symptoms. I tried to distract myself with reading, conversations, or playing games. I quickly found that having fun was the best distraction, so calling up a friend who always made me laugh, watching a funny movie, etc., became my go-to activities. Playing with kids and pets can be awesome, too. Getting plenty of rest. If you’re having heart palpitations at night, it’s very hard to get enough sleep. If you can make up for it with naps or an earlier bedtime, it’ll do you some favors. Otherwise, yoga and meditation can give you some of the benefits of rest in less time. They’re not a substitute for sleep, but they will make you feel refreshed. Remove stressful things from my life. This is tough. For most of us, the big stress comes from work, which we can’t survive without. If you can eliminate any stressful situations – or people – from your life, do it. Changing my thinking. You may need to ditch or delegate some responsibilities. You may need to cut ties with toxic people in your life. And you may need to reset your expectations of yourself. Affirmations. This is one of the tricks in the cognitive therapist’s bag, and there are books and articles on the subject everywhere. In a nutshell, affirmations are positive statements you say to yourself (or write down) quite a few times a day, or whenever you catch yourself thinking negatively. The trick to writing a good affirmation is: make it present tense and include zero negative words such as “not.” Instead of “someday I will have financial security” when you’re deeply anxious about finances, say “I have financial security.” Yes, it may be a lie, but the “fake it until you make it” principle applies. Instead of “I don’t have low self-esteem”, which involves a negative word, go with something like “I am confident and care about myself.” Make your affirmations as specific to your worries as you can. Keep an anxiety journal. Write down everything you worry about every day. You’ll be astounded at how many things worry you, and many of them will be so unlikely to happen or so far our of your control that it’ll all seem silly. If you’re concerned about anyone finding this and reading it, use codes – initials for names, shortened terms for events. This can be just as effective as the next tool I’m about to mention. Find a confidence-boosting partner. Find someone in your life who’s got a positive outlook and explain to them that whenever you’re discouraged or worked up about something, you’d like permission to call them up and discuss it so they can remind you that this, too, shall pass. Red tea. Red tea, or rooibos tea, or bush tea, is native to South Africa and has a sort of earthy vanilla flavor. Many varieties in stores will be flavored somehow, and they’re delicious. Red tea is naturally caffeine free and full of antioxidants and minerals. I don’t know of any studies to prove it, but a lot of people (including me) have found it helps make you more tranquil. It’s been said to help lower blood pressure, improve sleep quality, and promote a general feeling of well-being. That’s definitely been my experience with it. I found drinking a cup at bedtime especially helpful. And as far as I know, it doesn’t have any negative side effects, but again: do your own research. Green tea. Green tea is filled with L-theanine, an amino acid that calms the mind and promotes a feeling of well-being. It also contains caffeine so be aware of this if you’re reducing your caffeine intake. But because of the L-theanine, it can be a worthwhile trade-off. Don’t like the flavor? Try our green tea recipes. Get every new recipe, craft, and DIY post in your email. Subscribe on BlogLovin’. As an Amazon Associate, SnappyLiving earns from qualifying purchases.